For as long as she can remember, Laney has been having visions of the future that she sees when she makes physical contact with another person. Left on a doorstep as a baby, Laney’s past has always been cloudy to her, despite the clarity with which she can see the future. Her caretaker, Walt, claims to be her father, but Laney has a nagging suspicion that he isn’t quite telling her the entire truth. 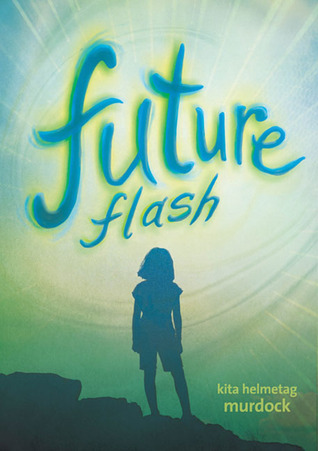 And when a new kid, Lyle, moves to her small town, Laney is dreading meeting him—she almost always gets a future flash when first meeting someone new, and the flashes aren’t always good. Unfortunately, her meeting with Lyle isn’t just bad; it’s painful. Engulfed in flames, Lyle’s future flash is the worst Laney’s ever experienced. But what does it mean? Is there anything Laney can do to change the future? And will she be able to save Lyle not only from a fiery death but also from the merciless class bully without becoming a victim of his antics herself? When I read many supernatural books, I think about how great it would be to have some of the powers I read about. Not so much with this one. Having a future flash would make life pretty difficult, especially if you don’t know if you can change that future. That is what Laney sets out to do. For the first time, she sees a future that isn’t just bad, it is deadly. Since she sees that Lyle’s future is coming soon, she wants to try to save, and learns a lot about herself and where she is from. This is one of the most suspenseful middle grade novels I have read! The reader knows the fire is coming and spends every moment while in the pages thinking “is this it?”. While you sit and wonder, you also start to really love these characters and want them to survive. This isn’t just a story about changing the future, it is mostly a story about friendship and family . Lyle and Laney both have complicated family lives and it shapes how they act. It adds a level to their characters that make them feel so genuine. You want to help these kids. This is a good book with a new look at a concept that has been around. Midddle grade readers will especially love the characters. This entry was posted on June 1, 2014 at 9:36 am	and is filed under Review. Tagged: contemporary, middle grade, science fiction. You can follow any responses to this entry through the RSS 2.0 feed. You can leave a response, or trackback from your own site.